Jeffrey's loss of virginity with RHPS happened like so many other first times, in the darkness of a college campus theater, alone. At least he had brought an umbrella for protection against getting wet during the proceedings! That initial viewing led to dozens of others at local theaters and art houses in eastern Washington and Idaho during the late 1980s, hooking him up with fellow local fanatic Little Myk. Together the two of them became a Rocky cast machine, performing bits of the movie whenever it was playing in the area, and leading The Time Warp at high school dances when the occasion called for it. "I wonder how everyone knew we were gay?" Initially, Jeff performed the part of Floorshow Rocky, sneaking his dad's truck out of the driveway and collecting his Riff Raff for the late night shows. By 1985, when it became apparent that Riff needed more to work with, Jeffrey began transforming himself into Jeff-N-F and formed a loose cast of 8-10 performers who were available for local shows. Creatures of the Night II has one of their cast photos, LipSchtick, on page 80. After moving to Eugene Oregon he formed a new cast, Forbidden Fruit, which performed a few times a year. But it was his work with Denver's Dynamic Tension, under the leadership of the infamous Bev Gerrish, that gained him national attention. 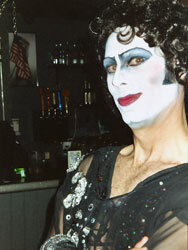 With weekly performances for the first time in his life, Jeff-N-F worked up his costumes and performance level enough to capture the Best Frank title at the Las Vegas convention in 1996. Memorable events with DDT include the Wizard of Oz night, where Jeff played Frank as the Wicked Witch and was killed when Riff through a bucket of "water" on him, Dead Celebrity night when Jeff performed Eddie as Elvis, and DDT Audience Choice Awards night, when he was awarded a fantabulous Frank doll made by Bev for his work as Frank. Jeff-N-F has attended many conventions over the years, but has particular fond memories of meeting Ricki Lake and Mindy Cohn at the 15th in Hollywood, being awarded the Best Frank at the 25th Anniversary in Vegas by Richard, Nell, Pat, and Dori, and returning to Denver to help host their convention in 1999. Currently, he lives in Seattle, and has performed locally as a guest with the Vicarious Theatre Company, and annually runs a performance in a seedy bar known as "The Cuff". This past December, he lived a dream with his boyfriend Erik when the two of them spent a night at Oakley Court in Windsor, and had martinis near the location of the original elevator shaft. Jeff-N-F has been stopped by police twice for minor driving infractions, in drag. Once they thought he was driving with a mask on. They always send him quickly on his way. Through it all, he remains true to his motto: Never disappoint your audience, and always choose good-quality gin.